A decision between which version of QuickBooks 2015 to pick should not come down to price (which, both versions happen to be on sale right now) but rather to the features you will require. 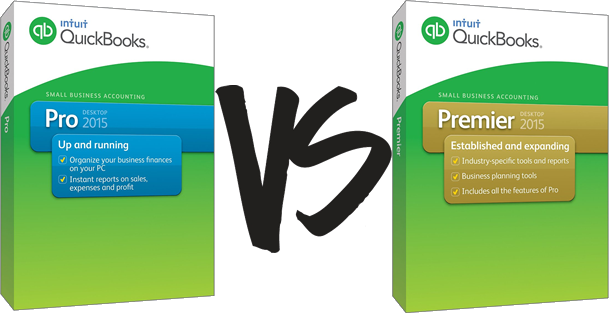 QuickBooks Premier is more robust than QuickBooks Pro but unless you take advantage of the additional features of the Premier, there is no reason to spend extra money. Below is an overview of both products and differences between them. I hope this will simplify your selection process. This version is applicable to most businesses without any emphasis on a particular industry. If your objective is to have control of your business, prepare estimates, invoices, make and receive payments, pay your employees, this is the product for you. Insights to the performance of your company directly form the home page. Reports have improved presentation for better understanding; they offer more customization and ability to share and make comments. Collaboration more efficiently with your accountant by saving your company file on a shared folder directly from QuickBooks without having to rely on external sources for file transfer. In one window display all important notes about the customers, see reminders and notifications to be more efficient. Besides the new features, Intuit provides Snapshot, overview of a company, customer, or payments available in your Shortcuts menu. Simply set up snapshot information you would like to see and have an immediate access to it without having to prepare reports from scratch. Now My Shortcuts also includes Reports, a feature that presents a glimpse into tax time reporting. It lets you track your income and expenses form one location and maintain reliable records for reporting time. QuickBooks Pro is also available as Pro Plus. They are the same product, the only difference is in pricing and services they include. The Pro is sold as a one-time payment where Pro Plus, although less expensive, is an annual payment. What may sway your decision to purchase Plus are the services Intuit bundled with this product. They include phone support, data backups, and software updates. Premier version has the same basic functionalities of the Pro version. The new additions to Pro and improved features are the same in the Premier version. What distinguishes the two products is the ability to perform tasks unique to your industry. QuickBooks 2015 Premier focuses on six different sectors: General Business, Contractor, Manufacturing and Wholesale, Nonprofit, Professional Services, and Retail. Intuit’s QuickBooks is a solid and tested product and its competitive pricing made it a leader among competing accounting software. Whether to upgrade from the last year’s version to a current one depends on how instrumental are the new features for your comfort and productivity. If you use 2013 or a previous version of QuickBooks Pro or Premier the latest release offer many improvements worth taking a second look. Sometimes it feels the new releases should make this product more robust when it comes to analyzing different company metrics. That expansion would most likely affect the cost of the product and would transform QuickBooks away from affordable and reliable accounting software for your business. And those qualities are the reason you’re contemplating its purchase.